Priced Lower Than Ever Before! Lots of Ways to Save! - For a limited time only, IDS Menus is offering our customers many ways to save on our state-of-the-art Drive-Thru communications systems. 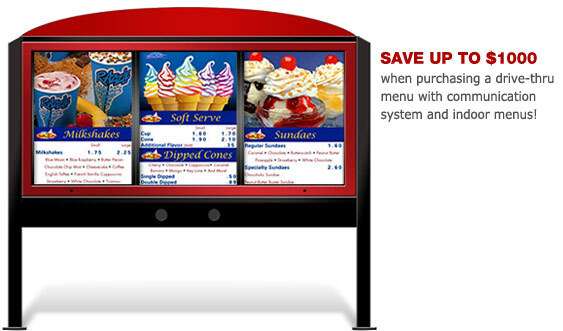 Savings range from $250 to $1000 when purchasing a complete Drive-Thru system with indoor menus. And if you decide to purchase two Attune headsets with your drive-thru, we'll throw in a third headset for free. That's an additional savings of over $800. How Do I Get Started? - Just contact an IDS Menus Sales Associate by filling out our web form. Or, contact us via Live Chat at the top of this page. If you prefer the to call, that's fine too: we're available from 9am to 5pm Eastern Standard time at (800) 542-9779. Our Sales Associates will help you find the perfect system for you place of business! Environmentally Friendly + Maintenance-Free - Our Drive-Thrus are green from top to bottom, with energy-efficient ballasts and bulbs that do not require replacement. Our LED lighting has a 12-year tested life-span, and you will consume one tenth the energy of many leading competitors on the market today. You'll save thousands in maintenance and electric over the life of the drive-thru – more than making up for the cost of the intitial purchase! Competitively Priced - We are priced at or below the cost of our competitors' light-bulb-burning, maintenance-hungry, energy-eating drive thrus! More Content - Our image area is 45% larger than our average competitors' drive-thrus- a whopping 25 square feet! Brighter - Our new green drive-thru series is 60% brighter than our previous drive-thru series.